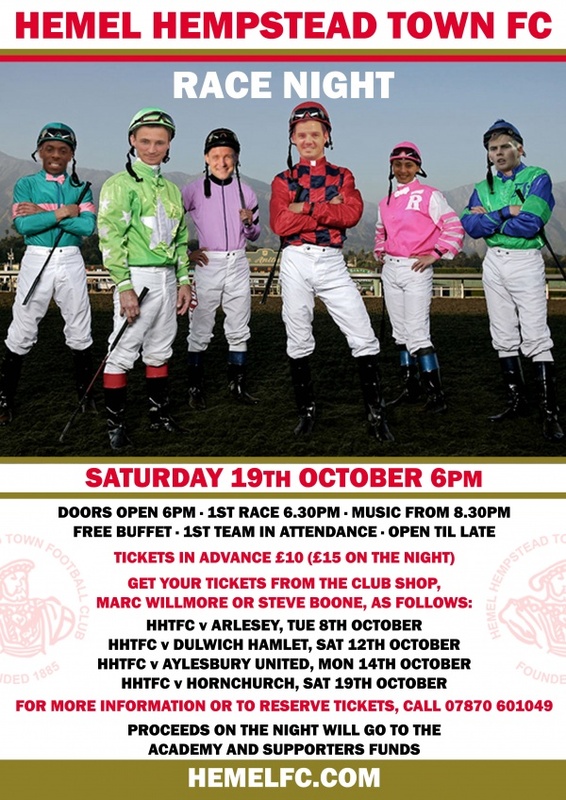 Straight after our game against AFC Hornchurch on Saturday 19th October, Hemel Hempstead Town will be holding a race night, with all the first team in attendance. The night starts at 6pm, with the first race at 6.30pm. There will be a free buffet and music will commence around 8.30pm. Proceeds from the night go towards the HHTFC Academy, due to begin again in earnest next season, and the supporters' trust fund for away travel days. FOR MORE INFORMATION OR TO RESERVE TICKETS, CALL 07870 601049.